In addition to the international exhibition of contemporary art by numerous artists from all over the world, the exhibitions based on the results of a competition for young artists. 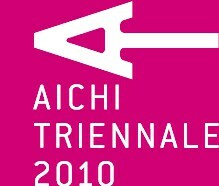 75 contemporary artists / art groups participated in the Aichi Triennale. The majority of the works were either newly commissioned or shown for the first time in Japan. The performing arts section of the triennial featured the world premieres of unconventional, cutting-edge works by 21 artists / groups, including a stage performance by Oriza Hirata and Ishiguro Laboratory (Osaka University) that involved a scientific collaboration between robots and actors. Works by Yayoi Kusama and Ryoji Ikeda in Aichiʼs symbolic urban spaces. Around 30 artists showed their artworks in urban spaces such as the Choja-machi site by incorporating the cityʼs history and landscapes into their pieces. For example, Nobuhiro Shimura presented works that use the eaves of storefronts as a screen, while Lucia Koch showed multicolored works in a spectrum of colors that will be exhibited in a wide range of places including shop fronts and on sunshades.